On the popular TV show Mythbusters the hosts Jamie Hyneman and Adam Savage made a miniature fake Moon set and took pictures on it that perfectly reproduced some of the Apollo photographs. Doesn't that prove the Apollo photos could have been faked in a studio? Yes. But the exact myth that Adam and Jamie busted was a little more complicated than that. Conspiracists say that pictures like Fig. 1 can only have been taken using multiple light sources. They say that the shadows which appear to fall in one direction in the foreground and in another direction in the background cannot have been made by only one light. And since the Apollo photos were said to be taken using only one light source (the Sun), the visible evidence in the photos doesn't match the circumstances under which they were said to be taken. The myth being tested is, "Shadows cast by a single faraway light source must always appear parallel." Naturally the way to test that is to set up a scene with some objects to cast shadows, and light it with only one light source placed far enough away. You can certainly do it at full scale. (And many other photographers and Clavius contributors have done just that.) Or you do it in miniature: all the geometry just scales down in magnitude, but remains valid for the test. The Mythbusters chose to do it with a scale model because they were trying specifically to replicate the observations in Fig. 1. Fig. 2 - The sun (left) sends out rays in all directions that diverge quickly with distance. Many studio lights (right) send out focused beams of light whose rays diverge less. Conspiracists note correctly that the sun is so far away that its rays arrive at the lunar surface practically parallel. The key to understanding why the Mythbusters' experiment is valid lies in two important points. First, you don't have to put an artificial light very far away from the scene before its rays are also parallel enough for scale photography. Second, their studio light employs a Fresnel lens that focuses the light. The sun sends out light in all directions. There is no lens for it. 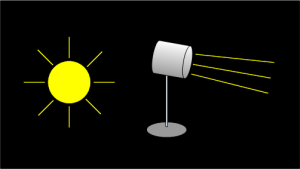 A Fresnel lighting instrument artificially limits the divergence of the light rays as they travel from the light to the subject (Fig. 2). Their experiment proved that terrain and contour also has an effect on how shadows are seen and photographed. And that effect wasn't accounted for in the conspiracy theorists' expectations. In more appropriate terms: "Myth Busted!" Conspiracists also say that photos like Fig. 3 cannot have been taken with only one light source because they interpret the shading and shadow on the astronaut to mean that light must be coming from multiple directions. They claim the good lighting on the shaded parts of objects, and on objects fully in shadow, can only be explained by the use of supplementary lighting (called "fill lighting" in photography lighting terminology). 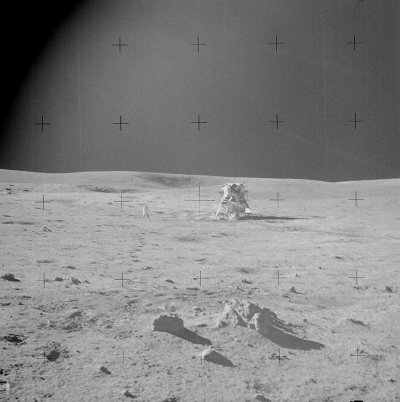 And since there was no explicit fill lighting techniques or equipment used on Apollo missions, conspiracists once again say the observed effects in the photo are inconsistent with the circumstances under which NASA says they were taken. The myth tested here is, "Where light comes from only one source in one direction, then surfaces that aren't directly lit must appear very dark." That too can be tested in a studio by scale models and studio lights. Lighting designers and photographers know that surfaces reflect light. Hence a study of "global" illumination effects from one light and its incidental reflections on objects in a scene only has to replicate the optical properties of the materials and their relative distances in order to be scientifically accurate. The strength of the light can be adjusted by varying its distance and its luminosity. The Mythbusters took great pains to achieve the proper reflectivity of the lunar surface and the space suit. Jamie is shown measuring the geometric albedo of his simulated lunar surface in exactly the same way astrophysicists measure the actual albedo of the real lunar surface: in the exact opposite direction from the direction at which the light arrives. We suspect that the light reflected from the lunar surface on either side of the lunar module's shadow provides the fill light for this scene. The Mythbusters set up a geometrically equivalent scene, made the reflectivity values also equivalent to the objects in the photo, and arranged scrupulously for only one source of light to illuminate the scene. 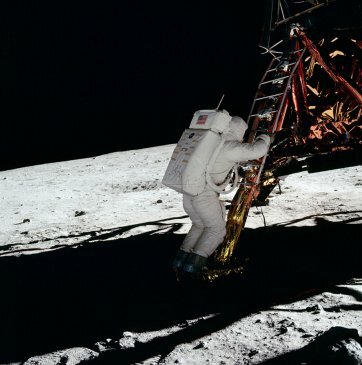 Their photographs show proportionally similar lighting levels to the "impossible" Apollo photograph, proving that the ordinary objects in the scene are sufficiently reflective. Again: "Myth Busted!" The Mythbusters' experiment is quite similar to other experiments that were done by professional film crews. A single light is most certainly capable of setting up complex patterns of diffuse reflection. The myth being tested in this segment of the show was not, "It's impossible to fake Apollo photography in the studio." Refuting the Moon landing hoax claims has never relied upon proving that faking it was impossible. Conspiracists want their critics to believe that's what they have to do. But the Apollo missions would be real merely if fakery wasn't done, whether such fakery would have been possible or not. Similarly if there's no meal on the table, it means that dinner just wasn't cooked, not that cooking the meal was impossible. Conspiracy theorists typically argue indirectly. They don't pit the merits of their theory against the merits of competing theories. Instead they try to erode confidence in some "official story" to the point where it seems arbitrarily incredible, whereupon their conspiracy theory is supposed to stand as the "default" conclusion when the official story fails. The conspiracists never put the conspiracy theory "default" to the test to see whether it too make sense. In other words, they never test their tests. The myths that were tested on the program are the basis for the conspiracy theory "rules" that purport to distinguish genuine photographs from fake ones. But before relying upon them, the conspiracy theorists never put them to the test. Their suppositions about shadow direction are wrong. Their supposition about fill lighting is wrong. In the real world, where there is no "default" conclusion and where both hypotheses are tested equally rigorously, the conspiracists' conclusions simply don't hold. They appear to hold only because the conspiracist authors manipulate the discussion to avoid a meaningful test. Ironically the conspiracy line of reasoning is the one based on suppositions of impossibility. They say it's impossible for shadows to behave a certain way under a single light. They say it's impossible for objects in shadow to be visible. Now that those things are shown to be possible, they have to find a new argument. The Clavius webmaster was a credited consultant on this episode of Mythbusters.